Today I bring you yet another recipe where we’ll use once again our all time favorite, cassava flour. 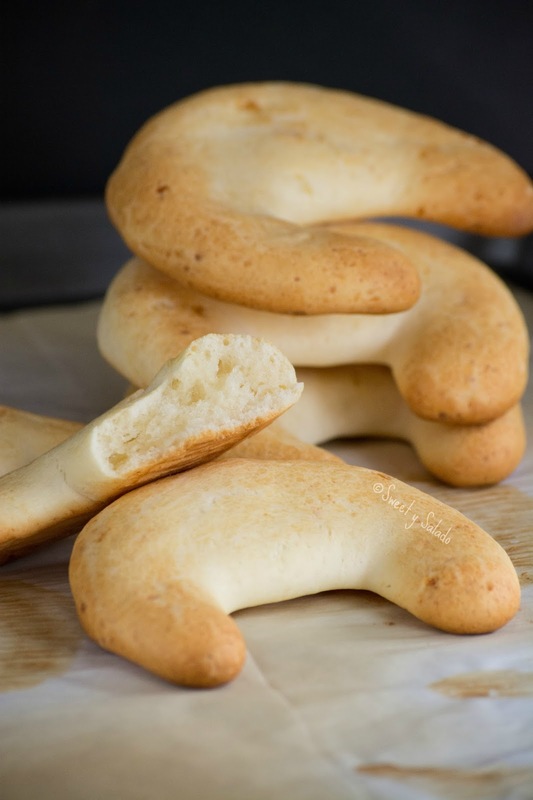 In Colombia we make lots of different things with this flour and depending on the amount of cheese that you use and the way you shape the dough, you end up making different types of bread. If the dough is nice and soft, we end up with pandebonos, if we fry it in oil, we end up making buñuelos, if we add all purpose flour, they become pandequeso and if we leave it in the fridge so the dough loses its moisture, it becomes pandeyucas (cassava bread), which is the way we’re going to make them in today’s recipe. 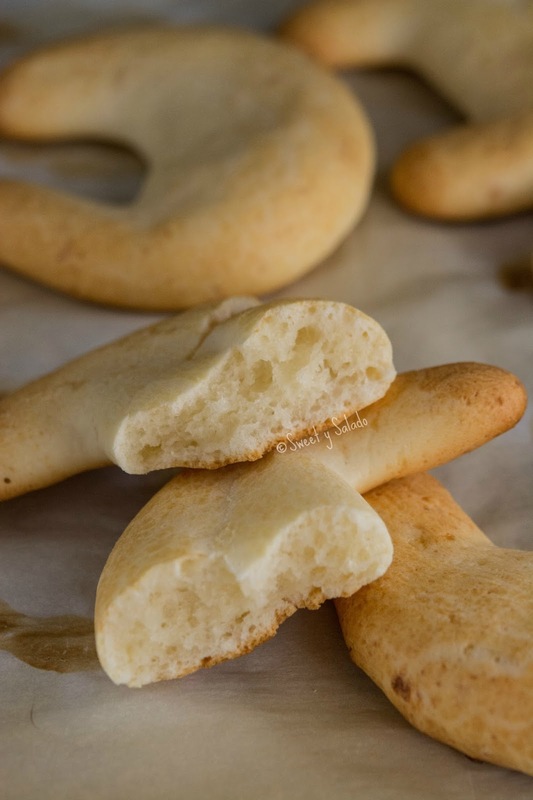 You will immediately recognize a pandeyuca based on its texture which should be crunchy on the outside and chewy on the inside. I have seen a lot of bakeries sell them really soft and spongy inside and out, and even though the flavor is delicious, they are actually pandebonos and not pandeyucas. Like I said previously, we get this crunchy texture by leaving the dough in the refrigerator for at least 3 hours so it dries up really well. Their shape is also very unique because they are usually shaped into crescent moons. Although I have been told that in the Valle del Cauca they sell them round and some times filled with guava paste and cheese. At the end of the day it really doesn’t matter how you shape them because I can guarantee you that if you follow my instructions to the letter, you will end up making super crunchy and chewy pandeyucas, in other words, perfect. In a large bowl mix the cassava flour, baking powder, salt and sugar. Add the cheese, butter and egg. Start mixing with your hands and add small amounts of milk while kneading until you get a soft dough. Shape the dough into a large ball, wrap with plastic wrap and store in the refrigerator for about 3 hours. 3. Take the dough out of the refrigerator and make small balls that measure about 2 inches in diameter (you can make them bigger if you want to). 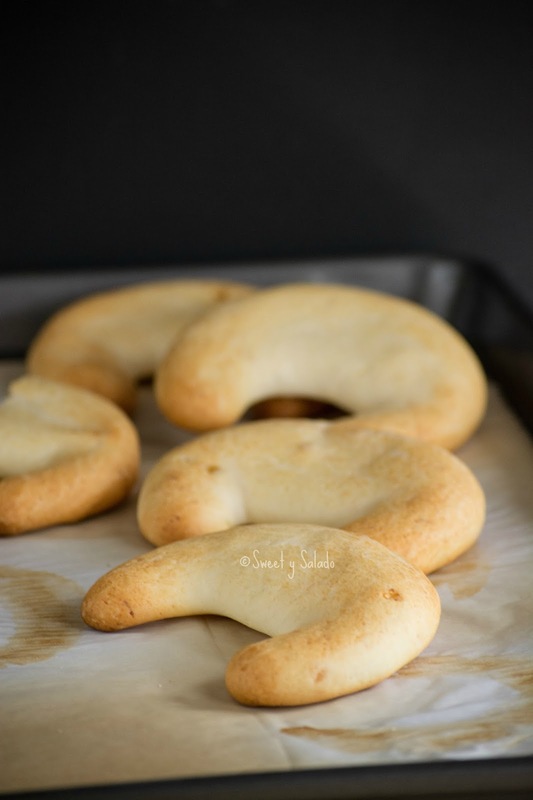 Then, roll each ball into a small cylinder or rope to shape it into a crescent moon, making sure the ends are thinner than the center of the dough. 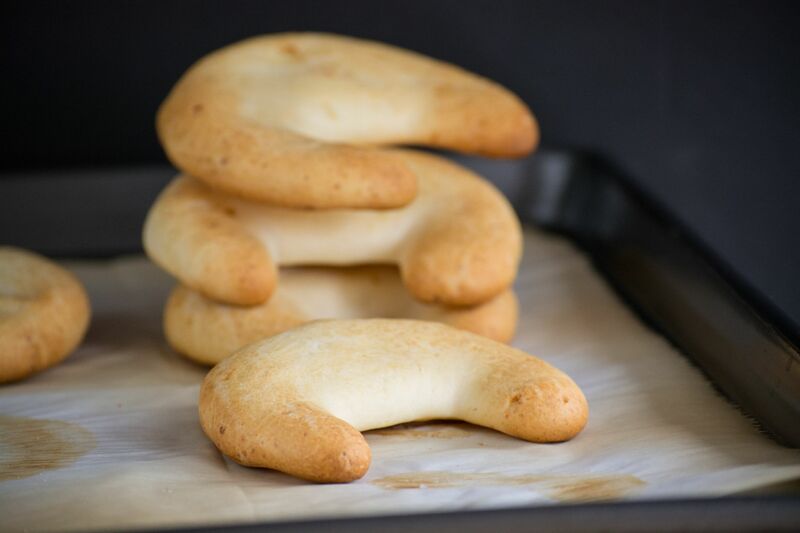 Place the pandeyucas about 1-2 inches (2.54-5 cm) apart on a baking sheet lined with parchment paper and bake them on the top rack of the oven for about 20 minutes or until they're golden brown. Serve immediately. These bread rolls are made with queso costeño in Colombia which tends to be quite salty. If you can find it, you can use it (instead of the queso fresco and feta cheese) to make them and not use any salt.